NCERT Textbook Solutions are considered extremely helpful when preparing for your CBSE Class 9 Physics exams. TopperLearning study resources infuse profound knowledge, and our Textbook Solutions compiled by our subject experts are no different. Here you will find all the answers to the NCERT textbook questions of Chapter 8 - Motion. All our solutions for Chapter 8 - Motion are prepared considering the latest CBSE syllabus, and they are amended from time to time. Our free NCERT Textbook Solutions for CBSE Class 9 Physics will strengthen your fundamentals in this chapter and can help you to score more marks in the examination. Refer to our Textbook Solutions any time, while doing your homework or while preparing for the exam. Yes. An object that has moved through a distance can have zero displacement. Displacement is the shortest distance between the initial and the final position of an object. An object which has covered a distance can have zero displacement if it comes back to its starting point i.e., the initial position. Consider the following situation. A man is walking along the boundary of a square park of side 20 m (as shown in the following figure). He starts walking from point A and after moving along all the sides of the park (AB, BC, CD, DA), he again comes back to the same point i.e., A. In this case, the total distance covered by the man is 20 m + 20 m + 20 m + 20 m = 80 m. However, his displacement is zero because the shortest distance between his initial and final position is zero. Concept Insight - Distance and displacement may or may not be the same. Displacement is always less than or equal to the distance covered. The farmer takes 40 s to cover 4 × 10 = 40 m.
Therefore, the farmer completes =3.5 rounds (3 complete rounds and a half round) of the field in 2 min and 20 s.
That means, after 2 min 20 s, the farmer will be at the opposite end of the starting point. Now, there can be two extreme cases. Case I: Starting point is a corner point of the field. In this case, the farmer will be at the diagonally opposite corner of the field after 2 min 20 s.
Therefore, the displacement will be equal to the diagonal of the field. Case II: Starting point is the middle point of any side of the field. In this case the farmer will be at the middle point of the opposite side of the field after 2 min 20 s.
Therefore, the displacement will be equal to the side of the field, i.e., 10 m.
For any other starting point, the displacement will be between 14.1 m and 10 m.
Concept Insight: - Be careful about considering the cases, as the displacement in both the cases is different. Displacement can become zero when the initial and final positions of the object are the same. (b) Not true Displacement is the shortest distance between the initial and final positions of an object. It cannot be greater than the magnitude of the distance travelled by an object. However, sometimes, it may be equal to the distance travelled by the object. Concept Insight - Displacement is always less than or equal to the distance covered. Speed is the distance travelled by an object per unit time. It does not have any direction. Velocity is the displacement of an object per unit time. It has a unique direction. Velocity is a vector quantity. The speed of an object can never be negative. At the most, it can become zero. This is because distance travelled can never be negative. The velocity of an object can be negative, positive, or equal to zero. This is because displacement can take any of these three values. If the total distance covered by an object is the same as its displacement, then its average speed would be equal to its average velocity, i.e. when the object moves along a straight line path. Concept Insight - Distance and displacement may or may not be equal to each other. Concept Insight - Convert all the quantities in the same units and then proceed to calculations. Speed of the signal = 3 × 108 m/s Distance travelled = Speed × Time taken = 3 × 108 × 300 = 9 × 1010 m Hence, the distance of the spaceship from the ground station is 9 × 1010 m.
(i) A body is said to have uniform acceleration if it travels in a straight path in such a way that its velocity changes at a uniform rate, i.e., the velocity of the body increases or decreases by equal amounts in an equal intervals of time. The motion of a freely falling body is an example of uniform acceleration. (ii) A body is said to have non-uniform acceleration if its velocity changes at a non-uniform rate, i.e., the velocity of the body increases or decreases by unequal amounts in an equal intervals of time. The motion of a car on a crowded city road is an example of non-uniform acceleration. Concept Insight - Acceleration is a vector quantity as it measured as the change in another vector quantity, i.e. velocity. Initial speed of the bus, u = 80 km/h Final speed of the bus, v = 60 km/h Time taken to decrease the speed, t = 5 s Concept Insight - Convert all the quantities in the same units and then proceed to calculation part. Here, the negative sign of acceleration indicates that the velocity of the car is decreasing. Concept Insight - Convert all the quantities in the same units and then proceed to calculation part. Hence, the acceleration of the train is 0.0185 m/s2. The distance-time graph for uniform motion of an object is a straight line (as shown in the following figure). The distance-time graph for non-uniform motion of an object is a curved line (as shown in the given figure). When an object is at rest, its distance-time graph is a straight line parallel to the time axis. 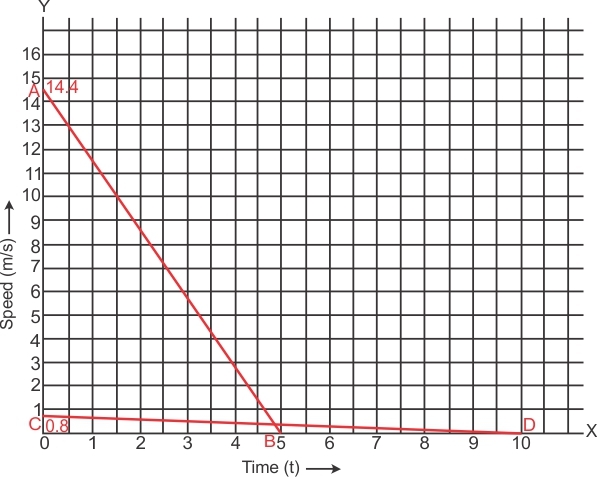 A straight line parallel to the x-axis in a distance-time graph indicates that with a change in time, there is no change in the position of the object. Thus, the object is at rest. Object is moving uniformly. 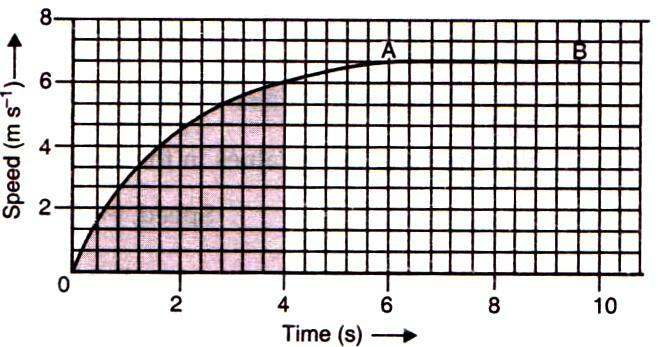 A straight line parallel to the time axis in a speed-time graph indicates that with a change in time, there is no change in the speed of the object. This indicates the uniform motion of the object. Distance The graph shows the velocity-time graph of a uniformly moving body. Let the velocity of the body at time (t) be v.
Hence, the area occupied below the velocity-time graph measures the distance covered by the body. (b) Concept Insight -First look at the quantities 'given' in the question and then the quantity need to be calculated. Further wisely choose the equation of motion out of the three, to minimize the calculations. So, speed acquired by the bus is 12 m/s. Initial speed of the train, u = 90 km/h = 25 m/s Final speed of the train, v = 0 (finally the train comes to rest) Acceleration = -0.5 m s-2 According to third equation of motion: v 2 = u 2 + 2as Concept Insight - Wisely choose the equation of motion out of the three, to minimize the calculations. (0)2 = (25)2 + 2 (-0.5) s where, s is the distance covered by the train The train will cover a distance of 625 m before it comes to rest. Concept Insight - Choose the equation of motion wisely out of the three, to minimize the number of steps in calculations. Hence, the velocity of the trolley after 3s from start is 0.06 m/s. According to the second equation of motion: Concept Insight - Choose the equation of motion wisely out of the three, to minimize the number of steps in calculations. Hence, the distance covered by the racing car after 10 s from start is 200 m.
There will be a change in the sign of acceleration because the stone is being thrown upwards. Concept Insight - Change in sign of the acceleration due to change in direction is crucial as it'll change the results. Let s be the maximum height attained by the stone in time t.
(0) 2 = (5) 2 + 2(-10) s Hence, the stone attains a height of 1.25 m in 0.5 s.
Concept Insight - Circumference of a circle is given by (2 × × r) where, r is the radius of the circle and = 22/7. In 40 s, the given athlete covers a distance of 200 m.
The athlete covers one round of the circular track in 40 s. This means that after every 40 s, the athlete comes back to his original position. Hence, in 140 s he had completed 3 rounds of the circular track and is taking the fourth round. He takes 3 rounds in 40 × 3 = 120 s. Thus, after 120s his displacement is zero. Then, the net displacement of the athlete is in 20 s only. In this interval of time, he moves at the opposite end of the initial position. Since displacement is equal to the shortest distance between the initial and final position of the athlete, displacement of the athlete will be equal to the diameter of the circular track. Distance covered by the athlete in 2 min 20 s is 2200 m and his displacement is 200 m.
Total distance covered = Distance from A to B + Distance from B to C = 300 + 100 = 400 m Total time taken = Time taken to travel from A to B + Time taken to travel from B to C = 150+ 60 = 210 s Average speed = = 1.90 m/s Displacement from A to C = AC = AB - BC = 300 - 100 = 200 m Time interval = Time taken to travel from A to B + Time taken to travel from B to C = 150 + 60 = 210 s Average velocity = = 0.95 m/s The average speed of Joseph from A to C is 1.90 m/s and his average velocity is 0.95 m/s. Concept Insight - Average speed and average velocity may or may not be same all the time. Concept Insight - Consider the two cases individually to make the calculations clear and easy. Hence, the average speed for Abdul's trip is 24 km/h. Acceleration of the motorboat, a = 3 m/s2 Time taken, t = 8 s According to the second equation of motion: Concept Insight - Choose the equation of motion wisely out of the three, to minimize the number of steps in calculations. Distance covered by the motorboat, s Hence, the boat travels a distance of 96 m.
Final speed of the car becomes zero after 5s of application of brakes. Final speed of the car becomes zero after 10 s of application of brakes. Concept Insight - Distance covered by each car is equal to the area under the speed-time graph. Thus, the distance covered by first car is greater than the distance covered by second car. Hence, the car travelling with a speed of 52 km/h travelled farther after brakes were applied. (a) Object B (b) No (c) 5.714 km (d) 5.143 km (a) Slope of the distance-time graph of an object indicates its speed. Greater the slope, greater is the speed. Among the given graphs, the slope of distance-time graph of object B is the maximum, so object B is travelling the fastest. (b) The distance-time graphs of the three objects A, B and C never meet at a single point. Thus, they are never at the same point on the road. (c) On the distance axis: 7 small boxes = 4 km 1 small box = Initially, object C is 4 blocks away from the origin. Initial distance of object C from origin= Concept Insight - Final reading will be initial distance already covered minus the total distance covered. Distance of object C from origin when B passes A = 8 km Distance covered by C Hence, C has travelled a distance of 5.714 km when B passes A. Hence, B has travelled a distance of 5.143 km when it passes C.
The ball will strike the ground with a velocity 20 m/s. Hence, the ball will strike the ground after 2s with a velocity of 20 m/s. (a) The distance travelled by the car in the first 4 seconds is given by the area between the curve and the time axis from t = 0 to t = 4 s. This area has been shaded in the graph below. Concept Insight: While counting the number of squares in the shaded part of the graph, the squares which are half or more than half are counted as complete squares but the squares which are less than half are not counted. 5 squares represent 2 s.
3 squares represent 2 m/s. Therefore, the car travels a distance of 16.53 m in the first 4 seconds. (b) The uniform motion of the car is represented by the part AB of the graph, which represents constant speed. (a) Possible When a ball is just released from a height, then it is being acted upon by a constant acceleration equal to the acceleration due to gravity i.e. 9.8 m/s2 but its initial velocity is zero. When a car is moving in a circular track, its acceleration is perpendicular to its direction of motion at each instant. Concept Insight - An object moving in a certain direction with an acceleration in the perpendicular direction is also possible. TopperLearning provides step-by-step solutions for each question in each chapter in the NCERT textbook. Access Chapter 8 - Motion here for free.